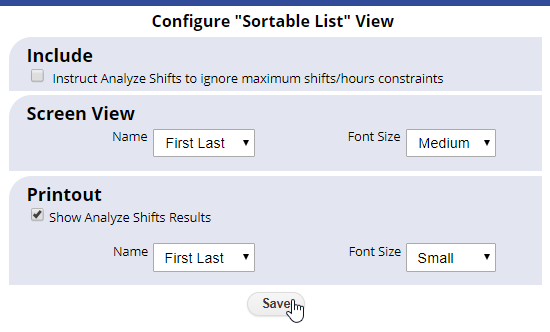 The Sortable List schedule view displays shifts for one day or week in a list that can be sorted by any column. This view also provides special functions such as clearing or deleting multiple shifts and allows for special filtering to show only unassigned, pre-placed or AutoFilled shifts. And it also allows you to ANALYZE shifts for conflicts if employee preferences or constraints have been changed since you assigned the shifts. ANALYZE shifts for conflicts on this view.